Reading the a past issue of The Economist I came across the article “Planning for the sequel”, about how Pixar is preparing itself to continue with its creativity levels for the long-term. “Employees show unfinished work to one another in daily meetings, so get used to giving and receiving constructive criticism. […] This system of constant feedback is designed to bring problems to the surface before they mutate into crises, and to provide creative teams with a source of inspiration. Having been a member of the public speaking association Toastmasters for two years I have had the chance of seeing hundreds of evaluations. Evaluations of prepared speeches, of impromptu speeches, of meetings, of evaluators, of skilled and beginner speakers… it is not a so easy task to sit and think in a couple of minutes of 5 things that you really liked and some valuable points of improvement. It’s even less easy to speak them up in a structured, candid and, at the same time, encouraging way. And that is another thing that you can learn in Toastmasters: giving feedback through effective evaluations. 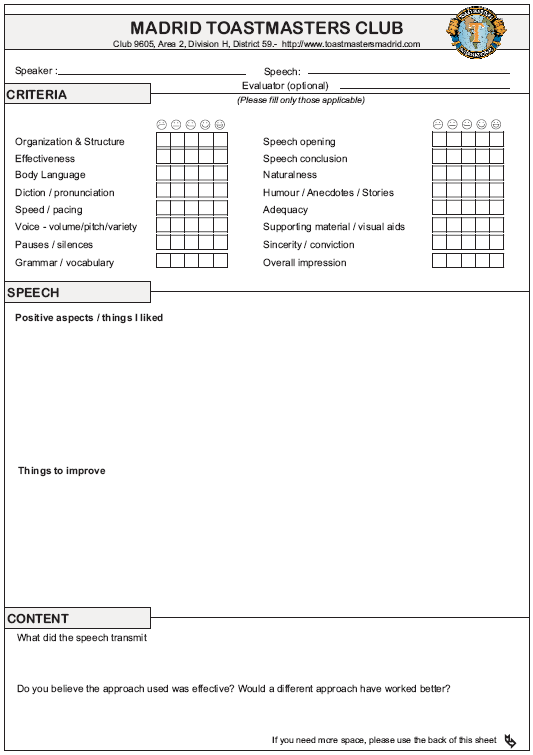 Madrid Toastmasters club evaluation form. No wonder that the majority of the 12,500 Toastmasters clubs worldwide are corporate clubs.